Sire- Australian Champion Kerusgal Orca Khan Dam- Roolflance Siegar. "Legend" was my first very own Rottweiler who's sire was bred by Gail Terry from my all time favourite kennel "Kerusgal". 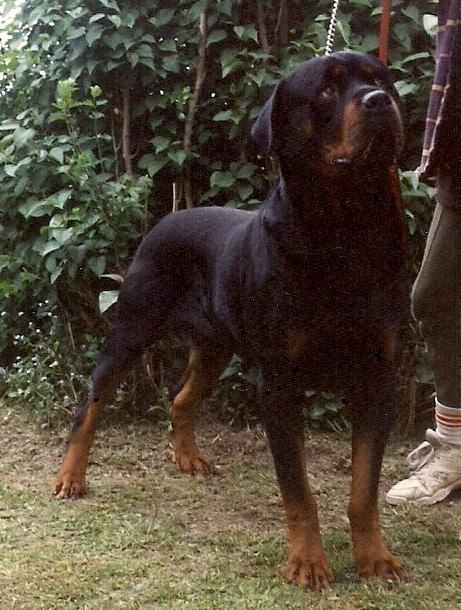 Aust Ch-Kerusgal Orca Khan was his sire & Roolflance Siegar was his dam. Legend had a short show career as he fractured a front leg at 11 months old, but up till then he did pretty well in the show ring taking his first Best of Breed at 7 months old. He had 5 CC's, 7 in Group awards & 3 BOB's then he had the accident and never got back into the ring. 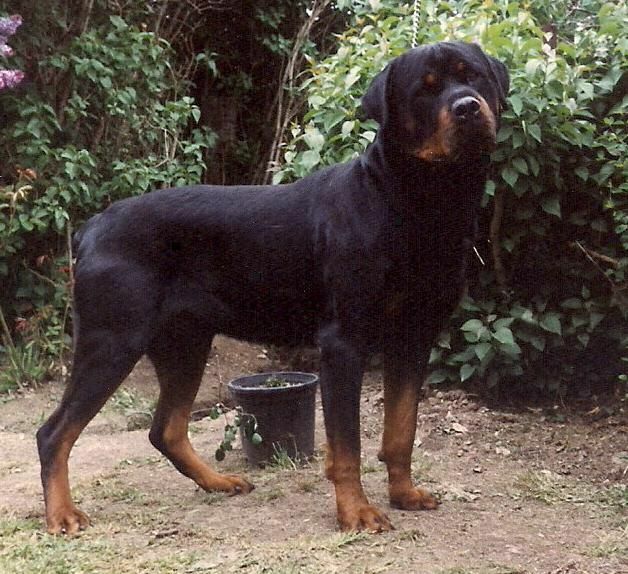 Legend was a large dog of maximum height weighing 60 kilo's once matured, he was a very handsome dog that people were drawn too. Legend went to sleep one night and never woke up, he was 8yrs 11months old without a grey hair on his beautiful face. Maybe the way he died was his reward for being such a wonderful companion. Do not stand at my grave and weep, I am not there I do not sleep. I am a thousand winds that blow, I am the diamond glints of snow. I am the sunlight on ripened grain, I am the gentle autumn rain. When you awaken in the morning's hush, I am the sweet uplifting rush. Of quiet birds in circled flight, I am the soft star that shines at night. Do not stand at my grave and cry, for I am not there I did not die. "Legend" got his wings on the 24th February 1997. Siegarhaus Black Sabbath aka "Legend" 8yrs & 6months old. Legend 8years & 6months old, nickname "Trooper"